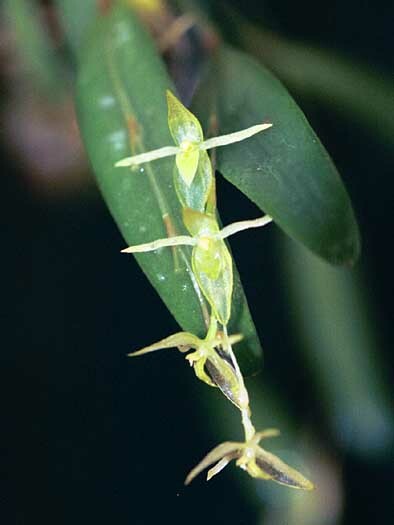 Pleurothallis pruinosa Lindl. 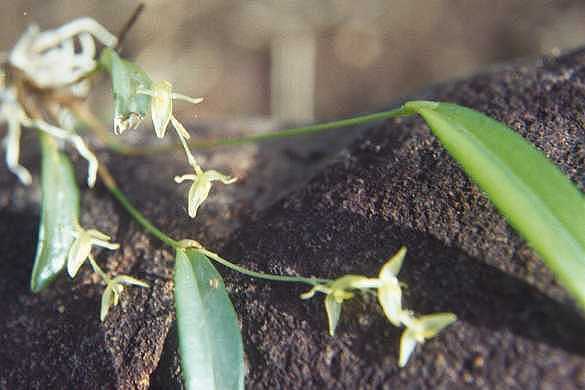 1842 SUBGENUS Pleurothallis SECTION Pleurothallis SUBSECTION Longiracemosae [Luer] Luer 1998 Photo by © Daniel Jimenez. 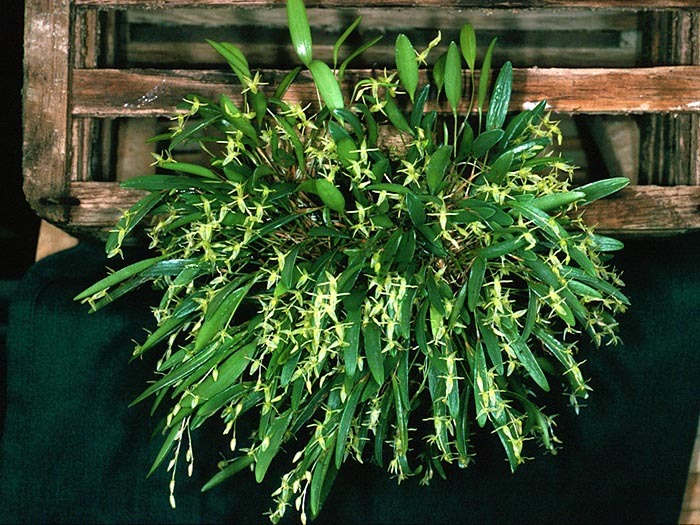 Found as a miniature, hot to cold growing, caespitose, unifoliate epiphyte in Honduras, Nicaragua, Costa Rica, Panama, Cuba, Dominican Republic, Jamaica, Leewards, Puerto Rico, Trinidad, Windwards, Venezuela, Fr Guiana, Guyana, Surinam, Colombia, Ecuador, Peru and Brazil in coffee plantations and wet montane forests at elevations of 150 to 2700 meters with erect, thin ramicauls enveloped basally by 2 tight, scarious sheaths and carrying a single, apical, coriaceous, elliptic-oblong or lanceolate, minutely tridentate apically, gradually narrowing below into the conduplicate base leaf that blooms in the summer on a 1 or 2, terminal, short, lax, simultaneously few [1 to 3] flowered racemose inflorescence that is held out and away at midleaf carrying a few insignificant, pleasingly fragrant flowers. Epiphyte low on shaded tree trunk above Lake Arenal at approximately 1200 meters in elevation.